Milton Keynes Heritage Cycle Trail B at Milton KeynesCycle RouteThis 22 mile circular cycle route can be accessed by using the Bedford - Bletchley Train Line. A shorter route of 12 miles is also available. The route takes you through some of the older parts of Milton Keynes which you may not be aware of. There are several car parks at Willen Lake. If driving, the route starts at Willen Lake South. If you are taking the train, the route can be picked up at Willen Lake South Point 1 which is close to Woburn Sands and Bow Brickhill railway stations. 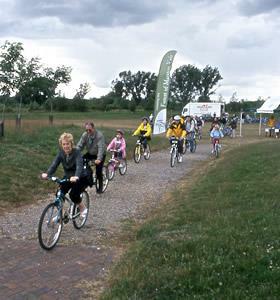 This 22 mile circular cycle route can be accessed by using the Bedford - Bletchley Train Line. A shorter route of 12 miles is also available. The route takes you through some of the older parts of Milton Keynes which you may not be aware of.